An HCA supplement (hydroxycitric-acid)is an extract of the fruit garcinia cambogia. This extract has the ability to block the absorption of carbohydrates in your body thereby helping you to lose weight. It can also improve your cholesterol profile as we will see. 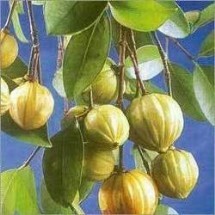 The garcinia cambogia fruit is a citrus plant that grows in southern India. It's extracts are used to make the nutraceutical HCA, which acts as a sugar blocker, preventing the body from processing carbohydrates into glucose. An HCA supplement contains a compound (2S,3R)-HCA, which inhibits two enzymes, alpha-amylase in the pancreas, and alpha-glucosidase in the intestine. This blocks carbohydrate absorption. This product should always be used with caution, and preferably with the knowledge of a qualified medical professional. It should be taken as part of a diet and exercise plan to lose fat and improve body composition. It should never be used to allow over consumption of carbohydrates. Hydroxycitric acid inhibits an enzyme called ATP citrate lyase, which is responsible for the synthesis of fatty acids, cholesterol and triglycerides. It is suspected that HCA suppresses appetite by raising serotonin level. Because of this effect, there are legitimate questions about the safety of this compound as a sugar blocker. The links are to Pub Med summaries referencing data on the safety and effectiveness of the HCA supplement tested. In an 8 week study with 60 human volunteers , HCA lowered BMI (body mass index) on average by 5.2%, and bodyweight by 5.4%. In addition total cholesterol, LDL, and triglycerides were all significantly reduced, while HDL significantly increased. There was also no conclusive proof of hepatoxicity (liver damage) from properly conducted studies. The research references don't seem to indicate a risk for this supplement when properly used. Hydroxycitric acid is a sugar blocker that seems to work and also appears to be safe when used as directed. With that said, I would remind you that no supplement can overcome a bad diet and lack of exercise when trying to make positive changes to your body. An HCA supplement should be used in conjunction with a proper diet and regular exercise to help a person “draw down” on their stored fat and reduce their overall fat mass. The fact that it also raises HDL and lowers LDL cholesterol is an added plus. It may be even more beneficial to those who have problems with obesity or difficulty losing fat, by inhibiting the storage of additional fat. Either way if you wish to use it, always do so under the guidance of a medical professional. My choice of brands for this supplement would be Citrimax by Life Extension.